[Privilege] One Echigo wine attaches about one Mr. Group. an unexplored region the foot in Echigo Mt. Komagatake and leading [ Japanese ] in snowy country Echigo, Okutadami, and a silver mine -- the hot-spring cure Ryokan in which an inn will be established with the ascent mouth "tochiomata" of the Shiori Pass which continues to common in 400 or so years.The name of a wooden structure also provides with the Taisho building the main building and wooden old wing, and visitor to a hot-spring resort who are built in the overhanging cliff of a deep ravine. A hot spring called 1200-year before in discovery is joint control. Upper hot spring It was used with the carrying-out hot spring, and the atmosphere of the deep ravine where the radium spring of the soft hot-spring point which wells ups not coming to which a "carrying-out hot spring" does not come from a ravine riverbed was also surrounded with the appropriate thing by the approach and the natural forest to a ravine has released best effect especially.The fountainhead original with others is also owned and there are also two charter baths and one charter half open-air bath inside a hall. It felt that do not go into rinsingoneselfwith hot water outside the bath by the taking-a bath method of a nagayu, but と also often got warm, the efficacy of radium or the whom who of end oversensitivity to cold was said to have not needed socks on the next day, and surely the hot spring of the body warmth temperature called feeling hot spring of un-felt warm in a leg. If it is an enough with [ of a ryokan with a hot spring ] a cook, he is just going to want to make the charcoal burner char of a Jizaikan have good reputation, the rice of Echigo Uonuma besides local culinary specialties "Noppe", and these three articles nominated.The whole wild grass hermitage was wrapped in the fragrant smell of the char charcoal burner, and it taught that the dish here was infallible. Please carry out a hot-spring cure slowly in quiet natural environment at the radium hot spring of rich efficacy. 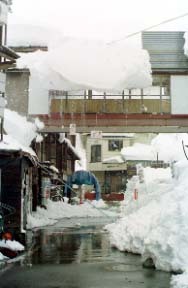 It is a complete view (under snow hut creation) at the time of a heavy snowfall. 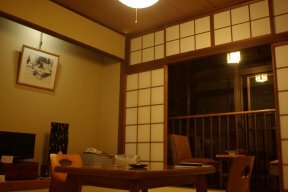 Yamaga dish.A charcoal burner is carried out in a single room luncheon party parlor "wild grass hermitage", and while it is hot, I am taking out. The wild grass of a produced in the district, charcoal grilling of river fish (char, a landlocked salmon, and a sweetfish), and か are also a cooked in a pot, risotto, etc. Restaurant: A supper is a wild grass hermitage and breakfast is a wild grass hermitage or a dining-room at half smorgasbord by a course. Noted-spring course: The charcoal burner of tempura and the Niigata beef, etc. 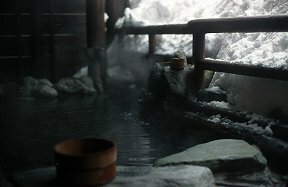 are added to a hidden hot spring course. A rainbow trout row slices, the another dish which feels the merit of water. Noppe Local culinary specialties broth and an acid taste were effective. It is wrapped in incense and inside is the best gently. The sweetness of vegetables is surprise. The hot-pot dish with duck meat and vagetables of taste oil. Or it is a dining-room and he is a smorgasbord. 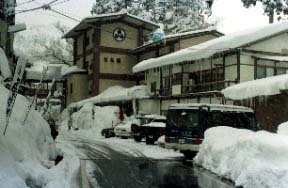 * In the tochiomata, the upper hot spring and carrying-out hot spring are controlled jointly. 33 halls, the enough lounge of a sunken hearth, etc.